Batroc The Leaper, AoU Iron Man And Spider-Woman Figures Are On The Way! You know how sometimes we get to see Toys a little earlier than usual thanks to Factory figures rolling onto eBay? Well, sometimes a boxload of toys just happen to show up too - and the new Marvel Legends figures have a lot to enjoy. Comics Batroc! Age Of Ultron Iron Man! 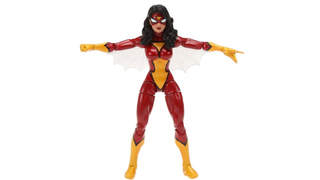 But above all: Jessica Drew, Spider-Woman! Photobucket User Dr. Zenith recently received two complete sets of the next waves of figures in Marvel's 6" line, revealing some things we hadn't know about before. First off is the upcoming wave of Spider-Man themed figures above, which, although we've known about for a while, still look pretty great: a new Daredevil, a classic Spider-Man and the addition of both Mayday Parker's Spider-Girl and Ultimate Jessica Drew to the roster all look pretty neat. Howver the Avengers: Age Of Ultron wave's roster is a lot more intriguing. Only three of the figures are actually from the movie - there's the Captain America and Hulk that were revealed at NYCC last year, and a new Iron Man based on the Mk. 42 suit from the film - and by the looks of it, it comes complete with an 'open faced' head showing off Tony Stark, the first time the Marvel Legends Infinite line has attempted one for Robert Downey Jr. But it's the comic-book additions to the wave that are the most interesting - there's classic Batroc the Leaper, the age-old foe of Captain America that got a significantly less-ridiculous update for his brief appearance in Captain America: The Winter Soldier, Hell Cat, and yes, finally - the Spider-Woman figure first revealed at San Diego Comic Con last year. In her classic costume before she get's a revamp this year, it's the first time Jessica has shown up in the line, and she looks great. Between her and Carol Danvers showing up recently, it's been quite a good time for awesome Marvel ladies getting toys! Of boxed waves are already starting to randomly show up for people, it's a good sign that these toys will be wildly available very soon. So many wonderful superhero toys, so little time.